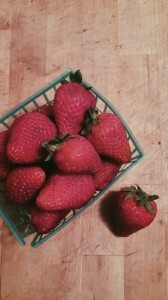 Spring is here and strawberries are available at the market! What better way to enjoy the warm weather than with refreshing strawberry frozen yogurt made with strawberries from Yerena Farms and amped up with a swirl of jam from Grandma’s Homemade?! Making this strawberry frozen yogurt with a jam swirl is super simple – puree yogurt with sweetened strawberries and spin into frozen yogurt, then layer with a jam of your choice, such as albion strawberry or raspberry. 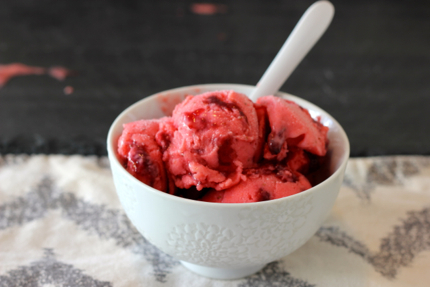 While it’s easiest to use a home frozen yogurt and ice cream maker (for example, the Cuisinart ICE-21 works great and is under $50), this recipe also includes basic instructions without using a machine. 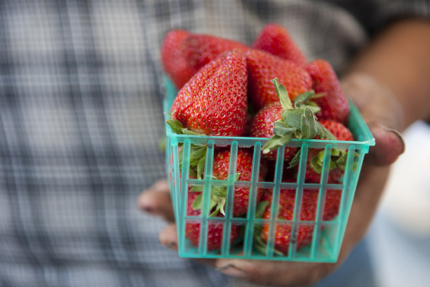 Pick up some strawberries and jam at the market this week and give making homespun frozen yogurt a try! Rinse and hull strawberries and slice into small pieces. Stir with sugar and vodka or kirsch (if using) until sugar dissolves. Cover and let stand at room temperature for about 1 hour, stirring occasionally. Puree the strawberries and their liquid with yogurt and lemon juice in a blender or food processor until smooth. Optional: press the mixture through a mesh strainer to remove any seeds. Refrigerate for 1 hour, then freeze in your ice cream maker according to the manufacturer’s instructions (see below for alternative instructions without a machine). 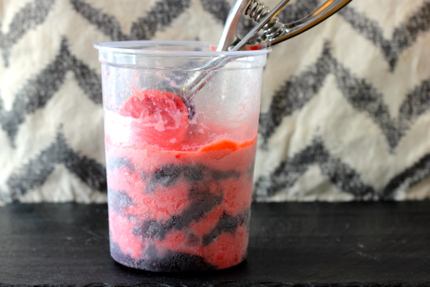 When ready, spoon a generous amount of jam into the bottom of a container and top with a layer of frozen yogurt. 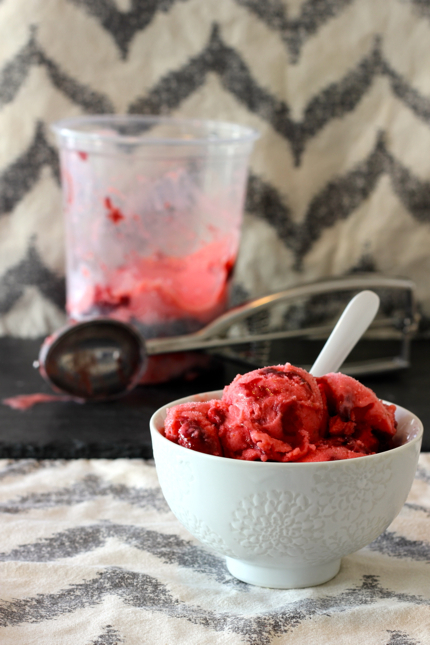 Repeat, alternating generous spoonfuls of jam with the rest of the frozen yogurt. The frozen yogurt will be fairly soft when first out of the machine. If you prefer, keep in the freezer until the frozen yogurt firms to your desired texture. If not using an ice cream maker, chill the yogurt-strawberry puree in a heavy-duty zipper-top bag with a reliable seal in the refrigerator for 1 hour. Nestle the sealed bag inside a larger zipper-top bag filled with ice and rock salt. Tightly seal the outer bag, then shake, toss, or roll the two together until the frozen yogurt freezes to a soft-serve consistency. At this point, move to a container and layer with jam as described above. Freeze until firm if desired. Spring is here! Cherry blossoms are beginning to bloom, the sky remains light into the evening, and the temperature is rising. However, spring means more than just beauty, rebirth, and an end to another wonderful winter, it also means strawberries! 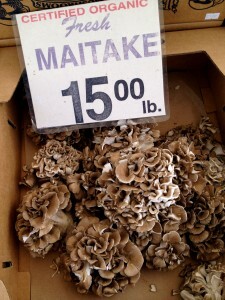 Mission Community Market welcomes back Yerena Farms to our Thursday market. Come by this week to grab a basket or three of this season’s freshest organic strawberries! 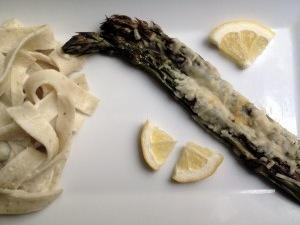 Feta cheese from Achadinha Cheese Co.
Wash and dry the spring greens. 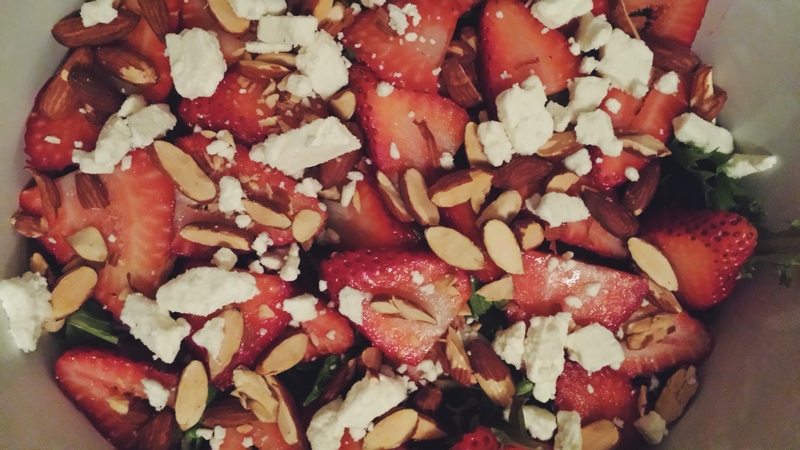 Gently sliver the strawberries to display their beautiful insides and sprinkle on top of cleaned salad. Add crumbled goat cheese and chopped almonds. Drizzle with balsamic vinaigrette and enjoy with a side of buttered sourdough from Marla Bakery or a pasta dish from Home Maid Ravioli! 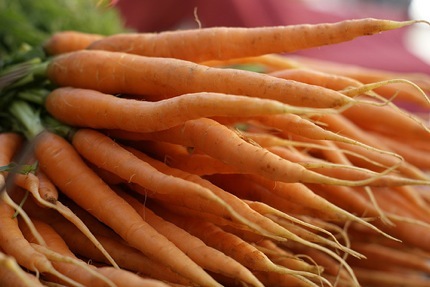 Delicious carrots are in season at the market! Celebrate the tasty root vegetable by making this sweet, creamy carrot soup. And don’t throw away the green, leafy carrot tops – you can use those to make fresh pesto that tastes great drizzled over the carrot soup. Pick up a bunch of carrots from Blue House Farm this week at the market and try it out! 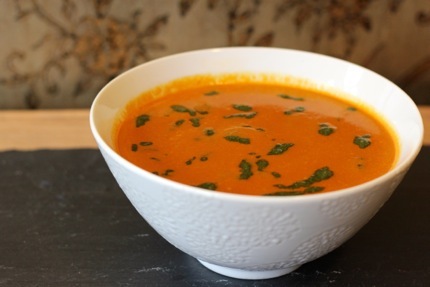 Carrot flavor really shines in this soup made with both carrots and carrot juice. The carrots are cooked in a pressure cooker, resulting in richly browned and caramelized carrots thanks to the addition of baking soda that triggers browning reactions. Plus carrots are at their sweetest in the winter when the cold encourages conversion of starches to sugars, making it an ideal time to enjoy this soup. Full recipes are after the jump! Our clocks have moved forward an hour, but our palates may still crave a little taste of fall. This week’s savory recipe highlights a few amazing items from our market, including microgreens from our newest vendor Lifefood Gardens! 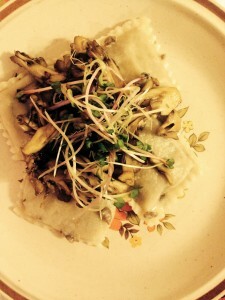 In boiling water, add raviolis (previously frozen). Boil on medium for roughly 8-10 minutes. In a separate pan, heat olive oil. Add rosemary and chopped mushrooms. Once this is cooked down a bit on simmer, add garlic. Stir occasionally. It is important to use a larger pan so the mushrooms do not crowd and the heat is on simmer. This concoction should simmer until the raviolis are compete and the meal is ready to be served. On a plate, place raviolis and drizzle olive oil, salt and pepper. 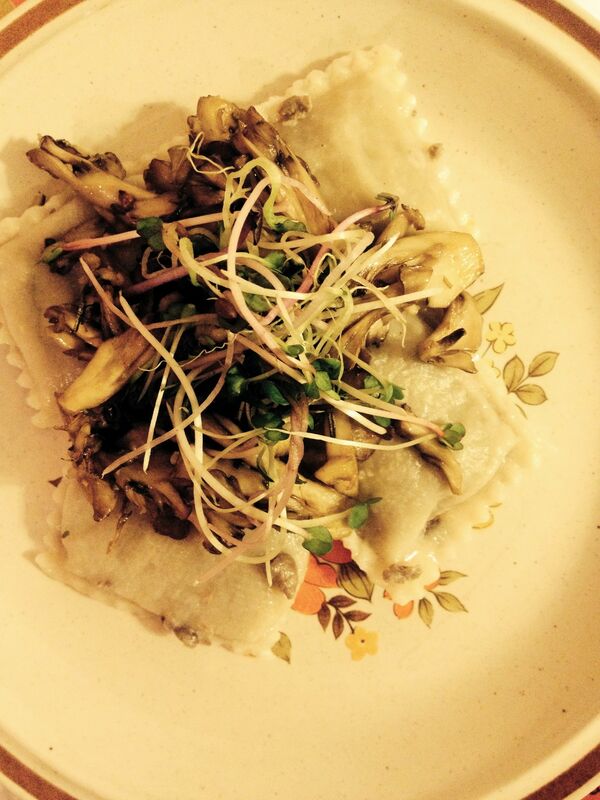 Place sauteed mushrooms on top of the raviolis and sprinkle a small handful of spicy microgreens to complete the meal! Enjoy with fresh bread from Marla Bakery or Arizmendi Bakery, available each week at the market! 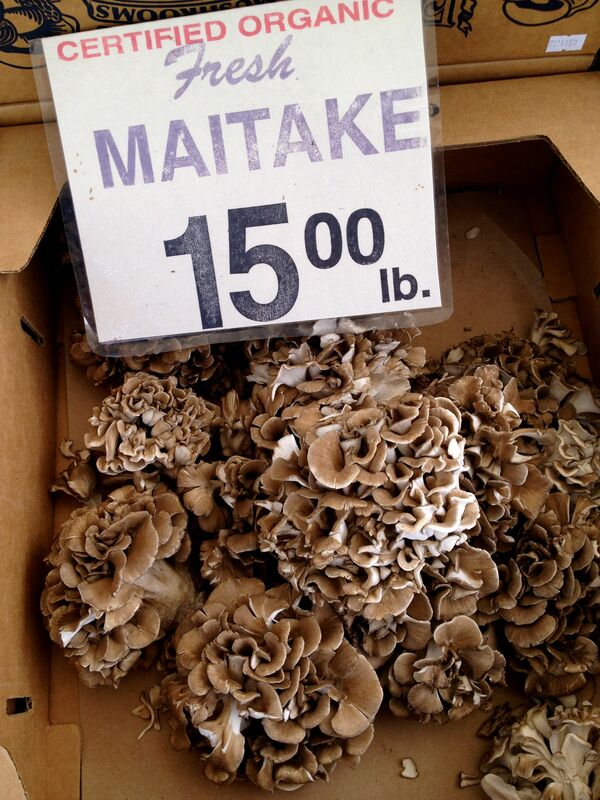 Mission Community Market is happy to welcome back Zuckerman’s Farm to the market! This beautiful 1,500 acre, multi-generational farm in Stockton brings a plethora of bright green asparagus to the market each week, as well as potatoes. Stop by the market this week, grab a bundle, and broil these babies for a tasty meal with the family! 1/2 cup of Freshly grated Capricious cheese from Achadinha Cheese Co.